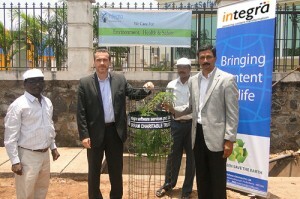 Coinciding with the world environment day, Integra Software Services Pvt. Ltd. along with Sriram Charitable Trust organized planting of samplings in 1st Cross Street at Brindhavan Nagar at Saram. 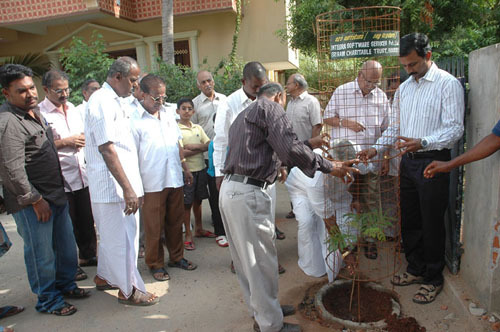 Sriram Subramanya, Founder – Managing Director & CEO, Integra and Managing Trustee Sriram Charitable Trust inaugurated the tree planting campaign in the presence of Mr. Vishwanathan, Member of the Legislative Assembly. Mr. Subbarayan – President, Mr. Raghupathy – Secretary, Mr. Devanathan – Ex. President, Mr. Sekar – Area Counsellor, Mr. Venkatesh – Properitor, Hotel Ananda Bhavan and Mr. Radhakrishnan – Retd. 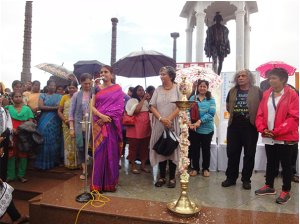 AGM, Pondicherry State Co-operative Bank were also present during this event. Sriram Subramanya, Managing Director & CEO, Integra during his inaugural address said, “People from all walks of life including youngsters, government, non-government authorities along with media need to come together to protect and save the environment in all possible ways.” He also sited reference on how Integra has deployed a sewage treatment plant to recycle water which is used to water the garden. As part of its Corporate Social Responsibility, Integra Software Services along with Sriram Charitable trust have been playing a key role in environment protection through various activities and awareness programs.